Custom printed t-shirts, custom embroidered baseball caps, and custom embroidered shirts and polo shirts made with your design for your business, organization, family reunion, or event is our specialty. Embroidery, screen printing, custom cut athletic lettering, numbering, and custom team designs services are available for both small and large orders of t shirts, baseball t shirts, and team apparel shirts. Brand yourself by printing your logo on T-shirts for customers may become fans. If you are arecording artist you can get your fans to wear your gear to promote your group. 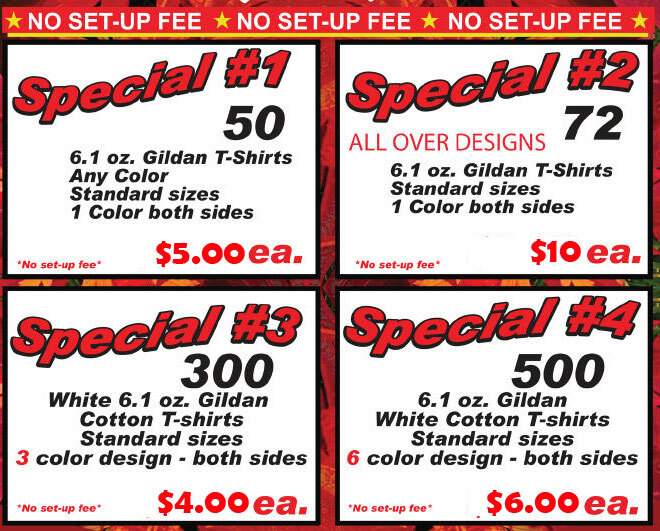 Our customer service can help you get the custom printed or embroidered shirts you need. Yours is a message you want seen, a mobile advertisement to announce your capabilities. We can help. Our staff has been printing for over thirty years and we are dedicated to delivering high quality at reasonable prices in a timely manner. -You need to call us Our rates are competitive Our service exemplary and you’ll love what you feel.